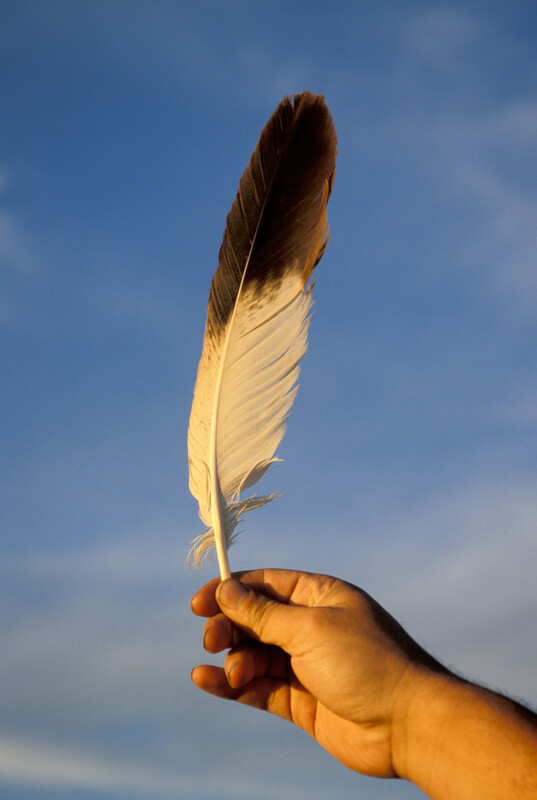 The Eagle Feather – Sunday June 19, 10:30 a.m. I was visiting in the hospital yesterday, and as is often the case, I ended up being the one strengthened. A member of St. Andrew’s introduced me to a fellow patient, who shared with me a poem she had just written: the verses were moving in their simplicity and sincerity, and each concluded with the refrain ‘I am crying tonight, I am crying tonight, I am crying tonight … Are you listening?’ Those words gave voice to what had been growing all week long within me. It has been a long week, with much crying. Across the continents … I heard the news that ISIS burned 19 Yazidi young women to death in iron cages in Mosel Iraq, for refusing to co-operate and offer themselves for the sexual pleasure of the terror group’s soldiers. The tears are all the heavier as I hear religion used to justify such inhumanity. And much closer to home … I have been preparing to begin a new week with National Aboriginal Sunday, and reflections on the relationship between indigenous peoples and others (like me) on this land. There are tears, many, and of many, but in their midst I am also provided with a way through the them. I am reminded about the indigenous tradition of the talking circle, and how the one holding the eagle feather speaks and all others listen. As our indigenous neighbours hold the eagle feather, and speak about their experience of treaties and residential schools and so much more, we called to listen. (Have a look at the recently released excellent resource A Time For Hope produced by the P.C.C., available at http://presbyterian.ca/healing/ ) And also, when we gather before God, it is as if we hold the eagle feather, with the assurance in Christ that our God listens … even and especially through our tears … and even now is responding for good, for all, with a realm of justice and peace in which we can place ourselves with commitment. Join us in the worship of God! The intersection of Princess at Clergy may be closed, but there is free parking on the streets around and in the public lot off Queen Street just behind the church. A nursery for infants 3 and under is offered during the service, as is a programme for children. Have a look at the announcements in the Sunday bulletin, and join us as you are able!